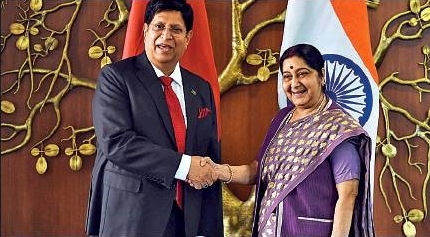 India and Bangladesh inked four MoUs and agreements as new Bangla Foreign Minister A K Abdul Momen met his Indian counterpart Sushma Swaraj on his maiden trip abroad a little over a month after the re-election of Hasina government. An MoU on mid-career training of 1800 Bangladesh civil servants, MoU between AYUSH and the ministry of health of Bangladesh on cooperation in the field of medicinal plants and MoU between Anti-Corruption Commission of Bangladesh and Central Bureau of Investigation of India were signed following India-Bangladesh Joint Consultative Commission meet. A MoU was also signed between Hiranandani Group and Bangladesh Economic Zones Authority to facilitate investments in the Indian Economic Zone in Mongla, Bangladesh. The conclusion of these four pacts will set the tone of partnership at the beginning of Hasina's fourth innings as PM of Bangladesh. The two ministers expressed satisfaction that both countries are working closer than ever before in every sector, from security and border management to mutually-beneficial trade and investment flows, power and energy, river water sharing, development partnership, transport connectivity, culture and people-to-people contacts. They welcomed the fact that the relationship was now broadening to include new and high technology areas for partnership, such as space, nuclear energy, IT and electronics, according to a joint statement issued after the meet. Swaraj expressed appreciation for Bangladesh’s humanitarian gesture of supporting a large number of displaced persons from the Rakhine region of Myanmar and assured the foreign minister of India’s continued support for safe, speedy and sustainable return of the displaced persons to Myanmar. Momen conveyed the gratitude of Bangladesh for the humanitarian assistance provided by India in four tranches since September 2017.